Teacher Talk™ is a training series based on Learning Language and Loving it. 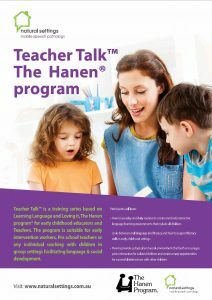 The Hanen program® for early childhood educators and Teachers. The program is suitable for early intervention workers, Pre school teachers or any individual working with children in group settings facilitating language & social development. 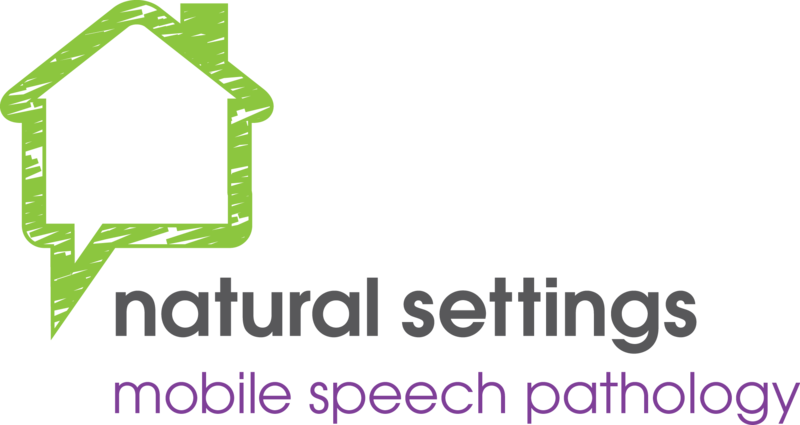 Natural Settings Mobile Speech Pathology is registered to run each component of the training series. Cost of training is $130 per participant per training day (including workbooks and notes) at your location. Minimum of 5 participants. Please note: Day 1 training must be completed before attending day 2 or 3. Participants will learn how to use play and daily routines to create enriched, interactive language-learning environments that include all children. You will learn links between oral language and literacy and how to support literacy skills in early childhood settings. You will also learn how to provide a physical and social environment that both encourages peers interaction for isolated children and creates many opportunities for successful interactions with other children. Training day 1: “Encouraging language development in early childhood settings”. Participants learn how to identify children’s conversation styles and the roles teachers play. They will learn to implement six steps to following the child’s lead; observe, wait and listen, face to face, imitate, interpret, comment and joining in play. Along with help children to become better conversational partners and using the five important steps to encourage interaction in group situations. Training day 2: “Let language lead the way to literacy”. Participants learn how to develop positive attitudes towards the use of print, make book reading a time for interaction and conversation. They learn to adjust their language during book reading to match the children’s stage of language development and encourage higher level abstract thinking during book reading and increase print awareness. Training day 3: “Fostering peer interaction in early childhood settings”. Participants learn how to make the best use of space in the classroom, encourage a variety of grouping for interaction, provide material and activities that promote peer interaction and support children’s interactions with peers. If this sounds like a program you or your educational setting could benefit from, please contact me to discuss current program availability or on site training.